1. Heat oil in a pan, and gently roast all the spices. Add gram flour and further roast. Add green chilli and chopped tomatoes. Cook slightly. 2. Now add both peas and kamal kakdi to the prepared masala and cook covered on low flame till tender. Garnish as desired. 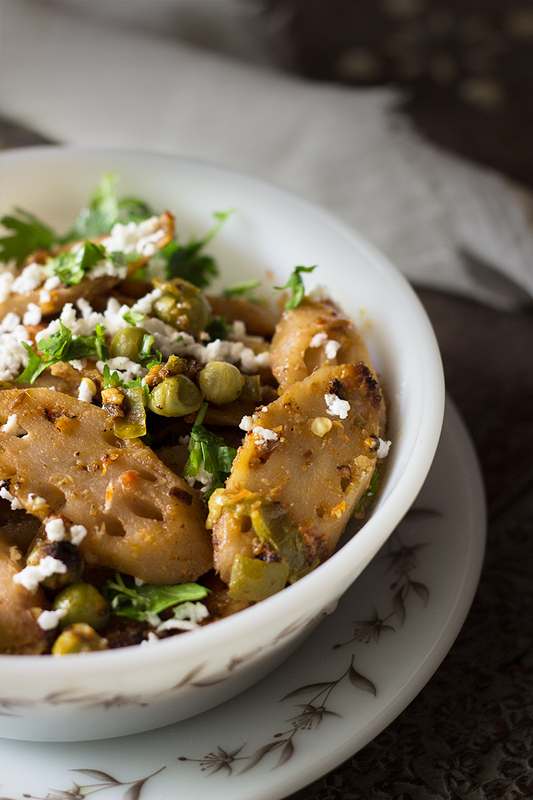 Serve hot with chapatis or paranthas. You can even make kamal kakdi in gravy form. Will share the recipe if I get another batch of the lotus stems in Pune. The recipe is very simple and you cook it like any vegetable. It tastes especially well with peas though. You can add potatoes also if you like.